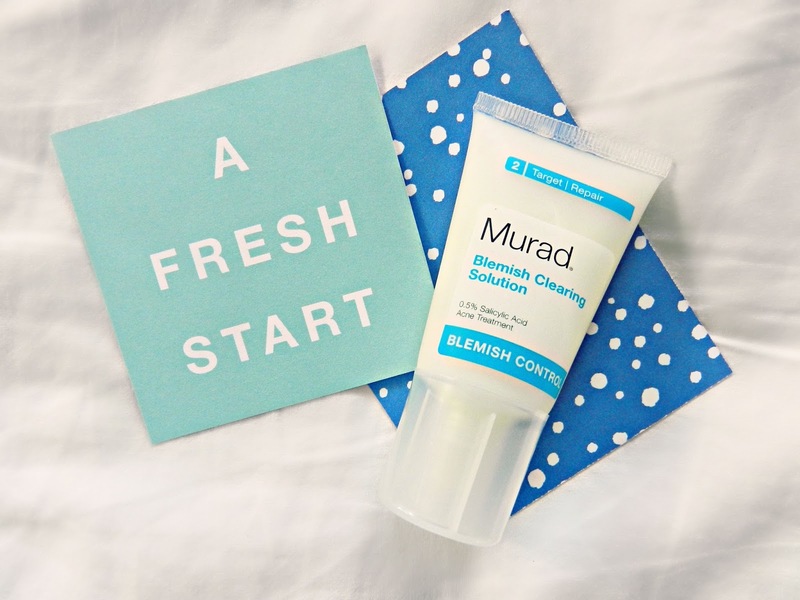 As common as acne-fighting, clarifying and blemish control products are in the world of skincare, I still haven't found a go-to product for breakouts. As much as I love the Proactiv commercials where Justin Bieber is like "Hey girl, you can look flawless too with the help of Proactiv", I find that their products are too heavy-duty for my skincare needs. 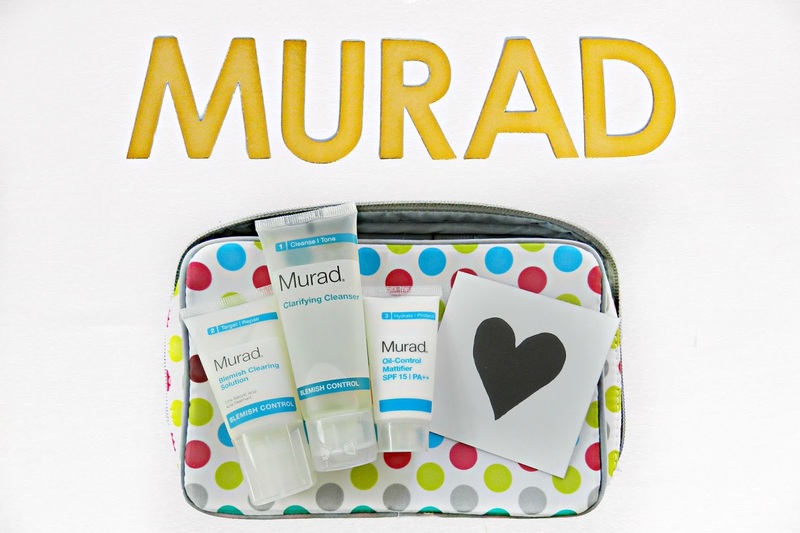 Enter the Murad Blemish Control Travel Set. 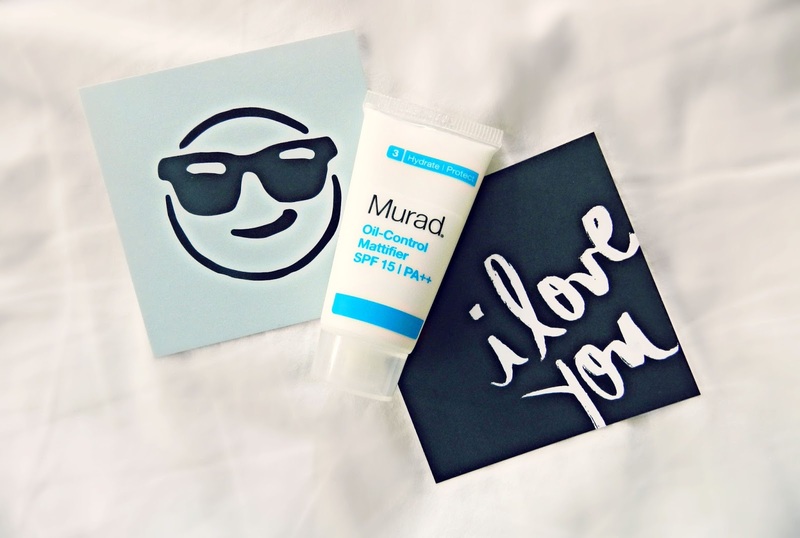 I have heard so many good things about Murad and was unbelievably excited to receive the Blemish Control Travel Kit. All three products come in the adorable polka dot travel bag pictured above, and since I'm obsessed with brightly coloured patterns, I'm a big fan of it. The travel bag is quite durable with small pockets inside, as well as built-in makeup brush/toothbrush holders, so you'll get a lot of use out of it even when you run out of product! I love that Murad sells a variety of their skincare lines in travel sets. They are actually the perfect size (not too big but not painfully tiny), and all come with the super cute travel bag. They're great because they allow you to try out a range of their products without committing to buying the full size product. This is HUGE considering how difficult it is to get a decently sized sample of most non-drugstore skincare products. Not everyone can drop $50+ just because they want to try a single product out. 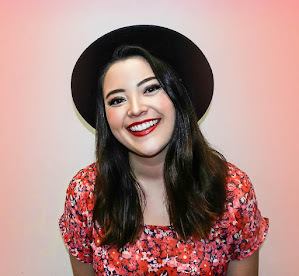 Acne's weird because it's sort of taboo to talk about but pretty much everyone has to deal with it at some point whether its that one problematic pimple or a never-ending cycle of breakouts. I've been lucky enough to have pretty clear skin my whole life but I find that when I do suffer from a breakout, it lingers for what seems like forever. 1) I have really sensitive skin. A lot of harsher products (a typical attribute of acne products) leave me with increased redness, and some just downright give me an awful rash-like reaction. 2) I don't like using spot treatments because they dry out my skin for weeks, and I find a lot of acne products tend to smell like industrial cleaning solutions. I'm not saying that I need them to be glamorous, but an upgrade from the gross medicinal smell would be nice. Anyways, if you have sensitive skin (and/or sensitive nostrils?) this might be the product line for you! The travel kit costs $40.00 CAD, and I have included all full-size product pricing below. Another thing to consider is that Murad is cruelty-free meaning they test their products on people, not on animals! The Clarifying Cleanser contains 1.5% salicylic acid and a lot of other complexly-named ingredients. From the words I can identify, it contains a lot of natural oils which is great because unlike most acne products, this cleanser did not dry my skin out. I was a little skeptical at first when I read that 92% of users saw clearer skin in 72 hours, but I actually did see a noticeable change in my skin (especially in my T-zone) within two days, and have had no breakouts anywhere on my face since. Here's hoping this trend continues. It hasn't got the loveliest scent in the world but it smells a thousand times better than any other acne product I've ever tried. I don't actually find the smell of this cleanser too overwhelming either unless I'm sniffing it directly out of the packaging for long periods of time (to clarify, I did this so I could write about it...I don't usually smell my face cleaners for fun). All you have to do is massage a small amount onto dampened skin and rinse it off with warm water (Surprise!). It's as easy as that. It lathers really well, has a nice cooling effect, and there's a slight tightening sensation when I rinse it off, leaving my skin feeling squeaky clean. The Blemish Clearing Solution contains 0.5% salicylic acid and is also meant to be applied to your entire face, neck and chest. The first thing I have to say about this product is that I love how lightweight it is. It doesn't smell or feel like a typical acne treatment. I find that a lot of acne solutions (whether they're gel or cream based) tend to feel like heavy, unabsorbable face masks or again, smell so much like an industrial cleaning product that I don't want to apply them. This solution is a blend of vitamins that soothe the skin, support healing, and stimulate cell growth while offering antioxidant protection. I can't really speak to how this product works on its own, but in combination with the clarifying cleanser I did see a noticeable difference in how quickly the few spots I had began to disappear and heal. I have nothing bad to say about the Oil-Control Mattifier besides the fact that it does have that sunscreen-y smell that some people can't stand, but I personally don't mind it in the Summer. I use this product instead of a primer, and it wears really well under both liquid and powder foundations. It also keeps my makeup from melting off in the heat. In terms of an acne solution, this moisturizer controls oil throughout the day as promised, and didn't cause any new breakouts (a problem I've had with other acne solution moisturizers). 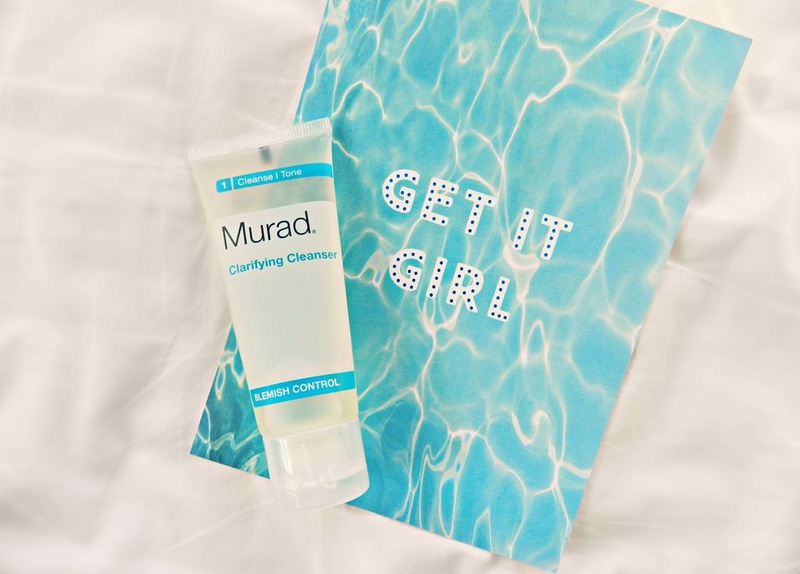 I'm not ready to proclaim that Murad's Blemish Control line is my go-to, heaven-sent, acne-fighting product, but for now I'm definitely sticking to it and plan to order more when I'm done with my travel set! My skin cleared up in less than a week without any signs of dryness or irritation, and it didn't take a ten-step routine to make it happen. Another perk? A little also goes a long way. To give you a point of reference, I had used each of these products for a week before remembering that I needed to take photos of them for this post! As you can see from the pictures, they still look pretty full. Disclaimer: I purchase most of the products I review on my blog myself, but sometimes I’m lucky enough to have the opportunity to try and review products sent by brands for consideration. I'm also lucky to have some amazing friends that may give me a gift or two from time to time. That being said, any thoughts and views expressed are always 100% honest and straight out of my own crazy brain. parfum choirose find it helpful to this article useful.